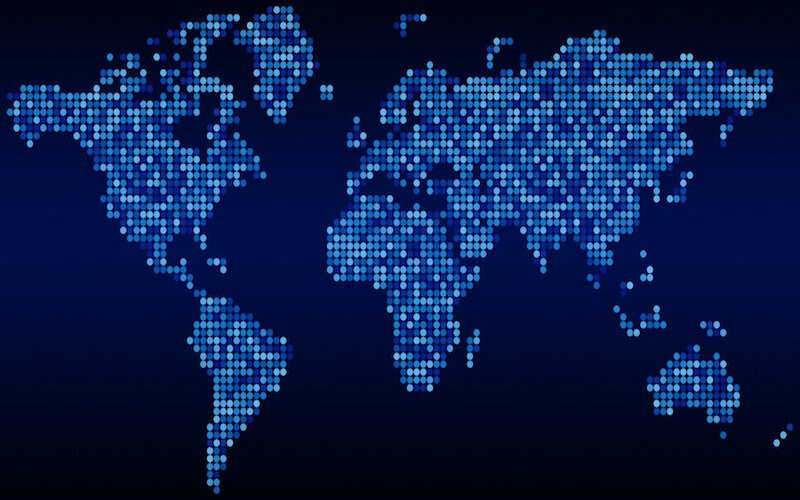 In the third annual ad blocking report, PageFair, with the help of Adobe, provides updated data on the scale and growth of ad blocking software usage and highlights the global and regional economic impact associated with it. Additionally, this report explores the early indications surrounding the impact of ad blocking within the mobile advertising space and how mobile will change the ad blocking landscape. Globally, the number of people using ad blocking so"ware grew by 41% year over year. With the ability to block ads becoming an option on the new iOS 9, mobile is starting to get into the ad blocking game. Currently Firefox and Chrome lead the mobile space with 93% share of mobile ad blocking. 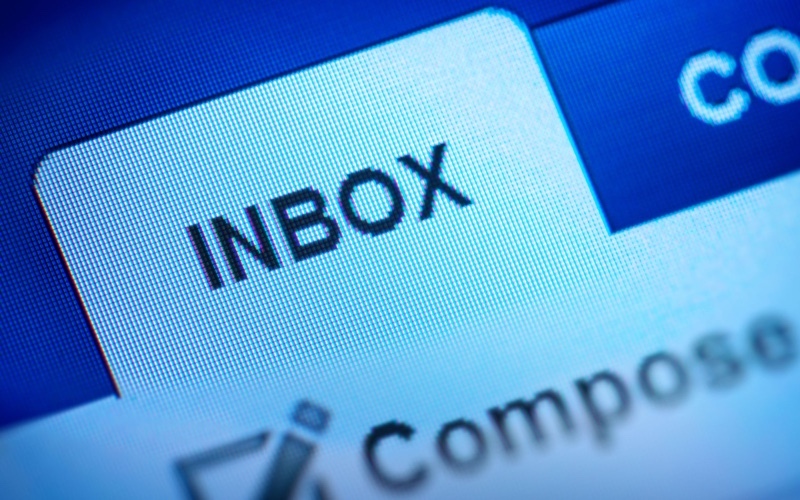 Blocking ads continues to build on the strong growth rates seen during 2013 and 2014. 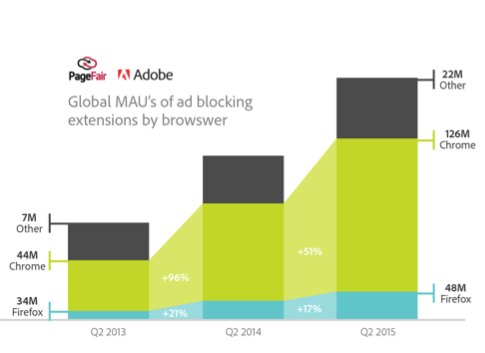 Globally, usage of ad blockers grew by 41% YoY (Q2 2014 - Q2 2015). As of June 2015, there were 198 million monthly active users for the major browser extensions that block ads. Ad block usage in Europe grew by 35% during the past year, increasing to 77 million monthly active users in Q2 2015. Ad block usage in the UK increased by 82% during the past year, reaching 12 million average monthly active users in Q2 2015. Ad block usage in Germany increased by 17% during the past year, reaching 18 million average monthly active users in Q2 2015. 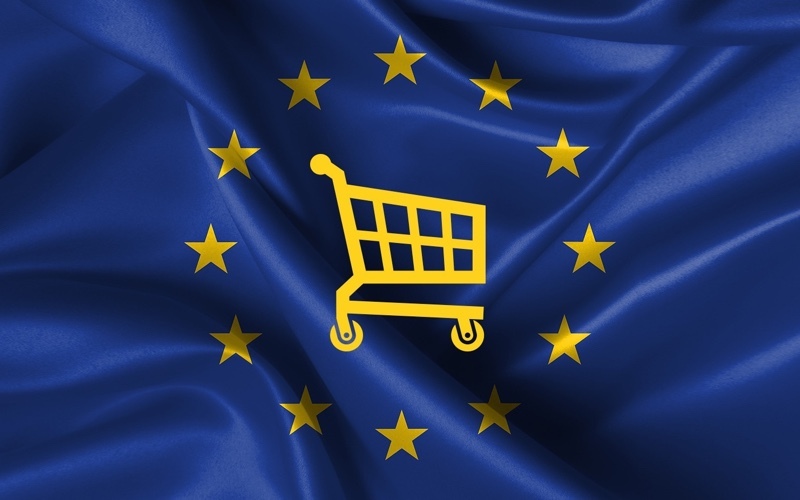 Greece has the highest rate of ad block usage in Europe. Slovakia has the lowest rate of ad block usage in Europe. 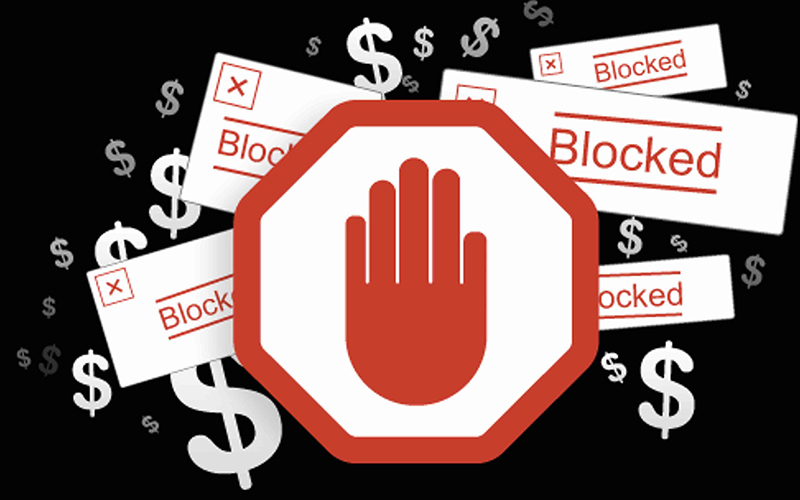 Ad block usage in the United States resulted in an estimated $5.8B in blocked revenue during 2014. 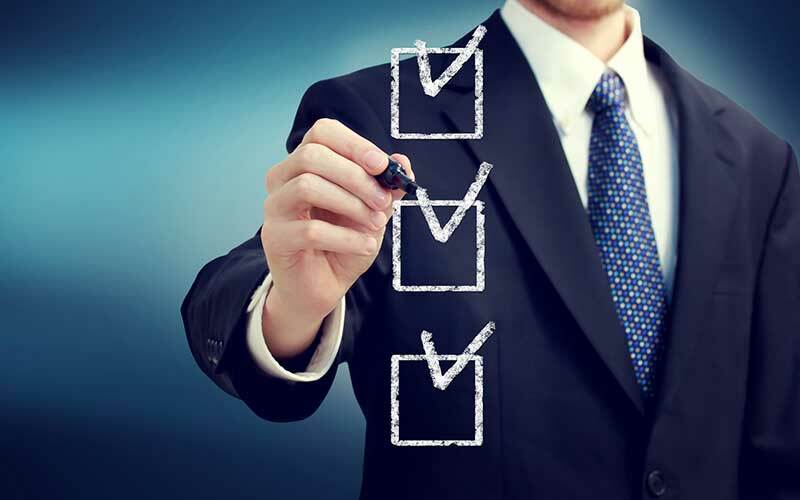 It is expected to cost $10.7B in 2015 and $20.3B in 2016. 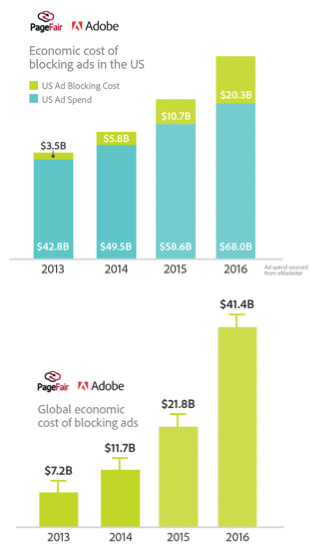 The global cost of ad blocking is expected to be $41.4B by 2016. 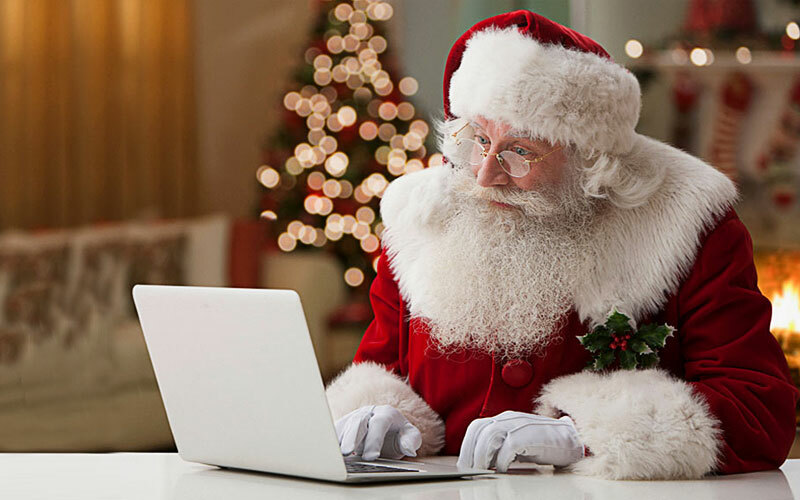 Although the 198 million MAUs in Q2 2015 represents only 6% of the global internet population, ad blocking is estimated to cost over $21B in 2015, which is 14% of the global ad spend.. Visitors to gaming websites are signi$cantly more likely to block advertising. Visitors to health, charity, and government/legal websites are signi$cantly less likely to block advertising. Ad blocking behavior on websites is a function of audience demographics. Websites that cater to young, technically savvy, or more male audiences are significantly worse affected. The ease with which ad block extensions can be installed on Google Chrome, combined with the continuing shift of internet users to Chrome for browsing, are major drivers of ad block growth. 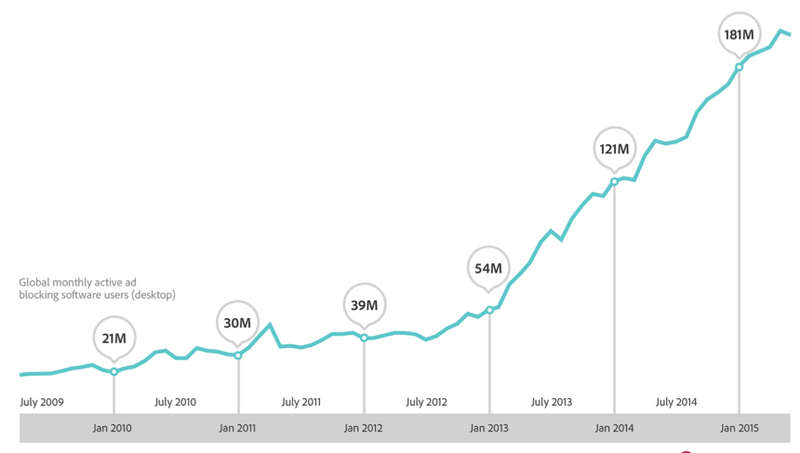 Ad block use on Chrome increased 51% from Q2 2014 to Q2 2015, reaching 126 million average monthly active users. Ad block use on Firefox increased 17%, reaching 48 million average monthly active users. Ad block use on Safari increased 71%, reaching 9 million average monthly active users. Over the last seven years, Chrome has steadily captured mainstream browsing market share away from Internet Explorer. It is well known that Google’s primary business is in online advertising; ironically, Google’s own browser appears to be bringing ad blocking to the masses. Although a large portion of online browsing is performed from mobile devices, mobile ad blocking is still very underdeveloped. !e release of iOS 9 in the Fall of 2015 may be a game changer, as it will allow users to easily install ad blocking from the App Store. 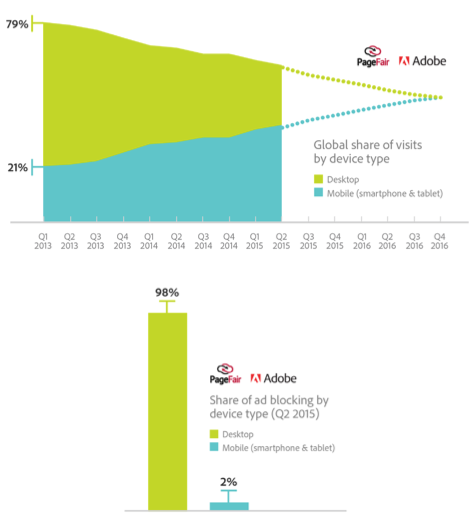 Only 1.6% of ad block traffic on the PageFair network in Q2 2015 was from mobile devices. The Adblock Plus app, which can be manually installed on Android devices, enables users to block ads within Chrome. !e Firefox mobile browser, which is available directly from Google Play, allows users to install ad blocking extensions. 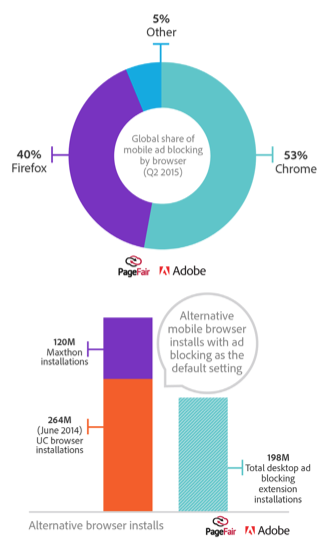 During Q2 2015, 40% of mobile ad blocking comes from Firefox users who had installed an extension to block ads. In June 2015, 16% of Firefox users on Android had configured ad blocking from within their browser se&ings. Mobile Safari represents 52% of the mobile browsing market (and 14% of total web browsing). With support for ad block apps in iOS 9, we expect ad blocking on mobile Safari to trend towards the levels seen in the mobile version of Firefox. We surveyed 400 respondents in the US and asked them to weigh in on ad blocking. Of the respondents who are not currently using an ad blocking extension, we asked what would cause them to change their minds. 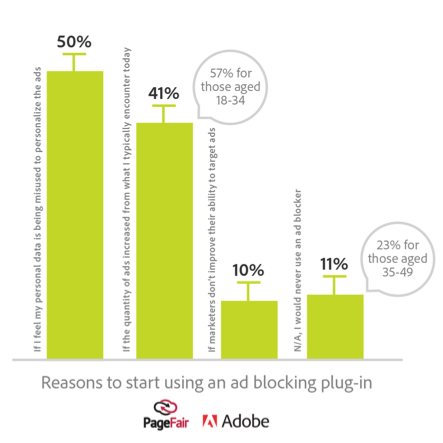 1 in 4 respondents aged 35-49 do not have any desire to ever use ad blocking software.